It may be my Southern roots, but there is something about a house with a porch! I've owned two houses in my life, both have front porches, and I hold strong to the fact that I won't buy a house without a front porch. There is just something about a front porch that makes a house feel more inviting and warm. It is also the perfect place for holiday decorating!! I am always inspired by the beautiful holiday porch decor featured in Southern Living and Better Homes & Gardens magazines, but I don't have the budget to carry out such elaborate schemes! 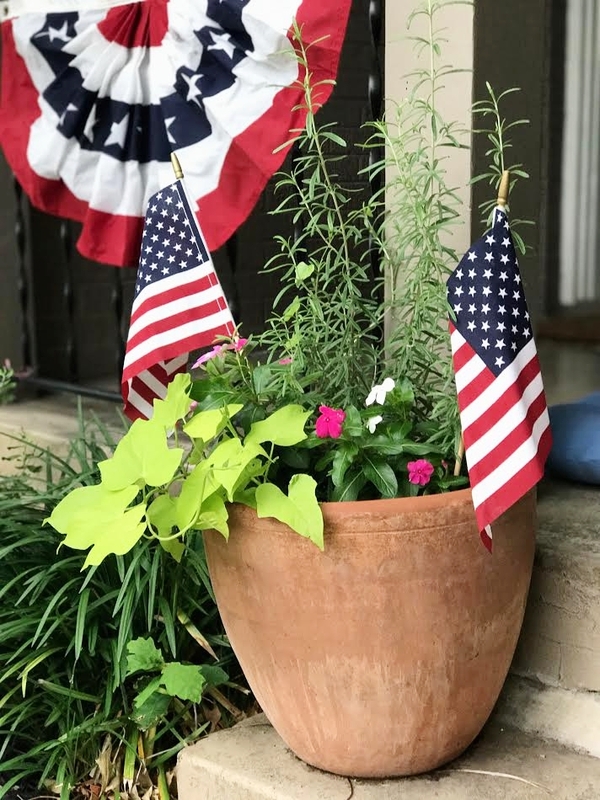 Instead, I rely on a few simple staples to create a simple patriotic inspired porch! Bentley helping me decorate the porch a few years ago!! -Flags, on flags, on flags!! In my mom's neighborhood in Arkansas, every year their neighborhood hosts a 4th of July parade in which all of the neighborhood kids parade around the neighborhood on their decorated bikes and golf carts. My mom and late step-dad would always line their drive way with little flags for parade day. When I moved to Dallas, I stole (shh!) about 10 flags from my mom's storage to bring with me. I now use those flags every year to line my flower bed and to add a pop to the two flower arrangements that flank my entry. -A front porch is useless if not outfitted with a pair of rocking chairs! My two wicker rockers always feature the blue seat cushions, but for the holiday I break out my burlap flag pillows. I purchased these pillows at a local craft market back in Arkansas one summer, but they would be a very simple DIY project!!!! -I typically try to include blue, white, and red into my annual flowers, but this year I went with a pink palette. I did decide, though, to update the flowers that sit on my front porch table. Though they won't receive enough light to flourish their for long, I decided to place a pot of red geraniums in honor of my late maternal grandma, Gladys. Red was her color, and in the spring time, she would always fill her window boxes and entry bed with red geraniums! If I had the room, and the shade, I'd definitely include some blue hydrangeas around my front porch! -A front porch wouldn't be complete without the cutest accessory of them all, a beautiful daughter and son (fur baby)! This is how I decorate for Memorial Day! I'd love to see your decoration ideas!! If you share them be sure to tag me!